MANCHESTER – 15th April 2019: For this month’s Innovation Insight, we look at the rise of ‘two in one’ concepts in the bakery category. 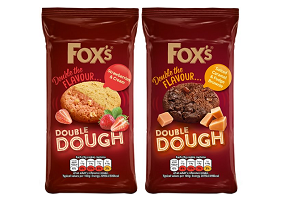 Under the spotlight is a recent launch from Fox’s Biscuits that aims to add distinctive ‘double flavour’ variety to the biscuit aisles – Fox’s Double Dough Biscuits. Newly launched in the UK, Fox’s Double Dough Biscuits aim to “shake up the biscuit category” with a distinctive approach to flavour blending. Perhaps taking inspiration from traditional ‘two flavours in one’ bakery products such as pinwheel biscuits and marble cakes, the launch comes in a unique ‘half and half’ format, with two different flavoured doughs joined in the middle such that one side of each circular biscuit contains one flavour, and the second side a different flavour. This format, which Fox’s Biscuits said required “precision baking” and new production machinery, also results in a distinctive visual identity for the biscuit, with each half differing from the other in colour as well as in flavour. Initially two indulgent flavours have been launched: one combining the flavours of strawberries and cream, and a second bringing together salted caramel and fudge brownie. The notable trend in UK bakery for dessert-inspired, multi-dimensional flavour – as further evidenced by Fox’s Double Dough Biscuits – points to growing demand among consumers for more playful and decadent cake and biscuit concepts. From products such as trifle-flavoured biscuits to milkshake cake bars and confectionery-cake hybrids, as well as Fox’s Biscuits latest launch, recent UK bakery NPD has understood the need to generate added excitement by ‘going the extra mile’ in terms of flavour or format innovation, appealing to consumers’ appetite for new types of indulgence in the cake and biscuit categories.